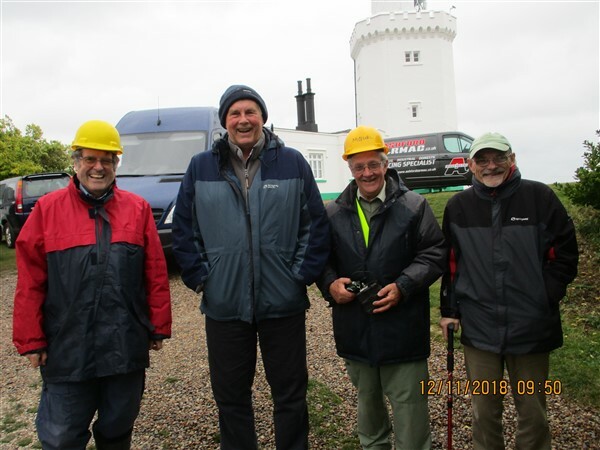 As planned, the ROA Installation team arrived on site at South foreland Lighthouse at 1030AM on Saturday 10th November. It was blowing a gale with very heavy rain showers. Lead installers were Robin/G3OGP and Peter/M0URL supported with excellent assistance from our Chairman Tony Selman and Pat Powell. 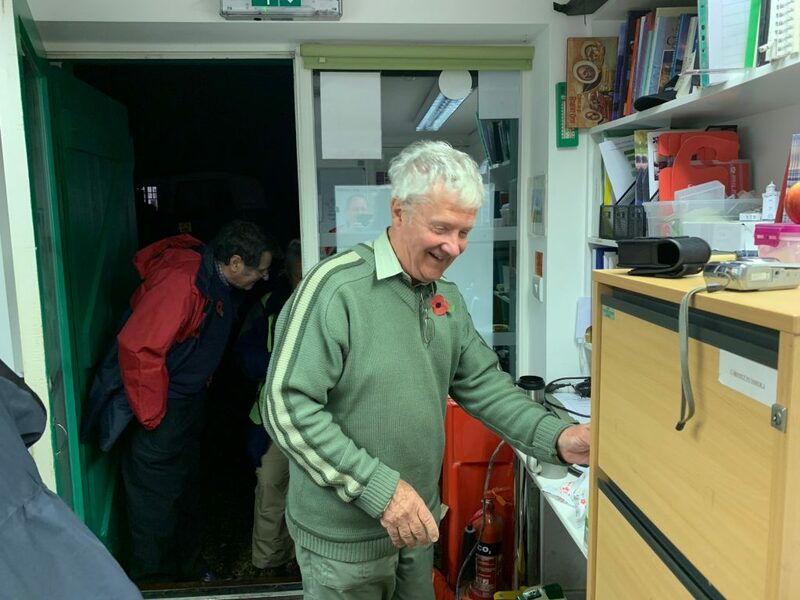 Due to the inclement weather it took much longer than planned to set up the two 30-foot metal masts in sections, one of which was secured to the side of the office allocated by the National Trust, by U bolts and the other in an adjoining field supported by 4 guy ropes. 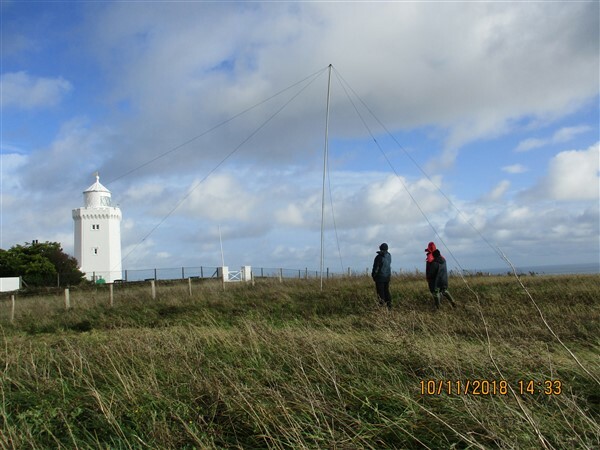 A 22.5 metre wire antenna was then hoisted up along with a counterpoise which was secured to a wire fence. Further earthing was provided by a metal spike driven into the ground located just outside the office allocated as our Radio Room. 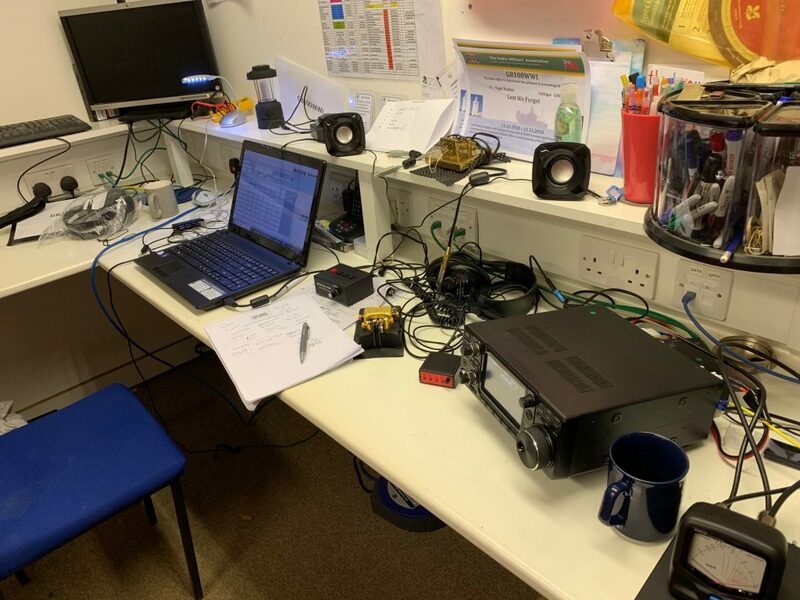 This office was well furnished by the NT who had also kindly provided tea making facilities, biscuits and good heating for the room if required. 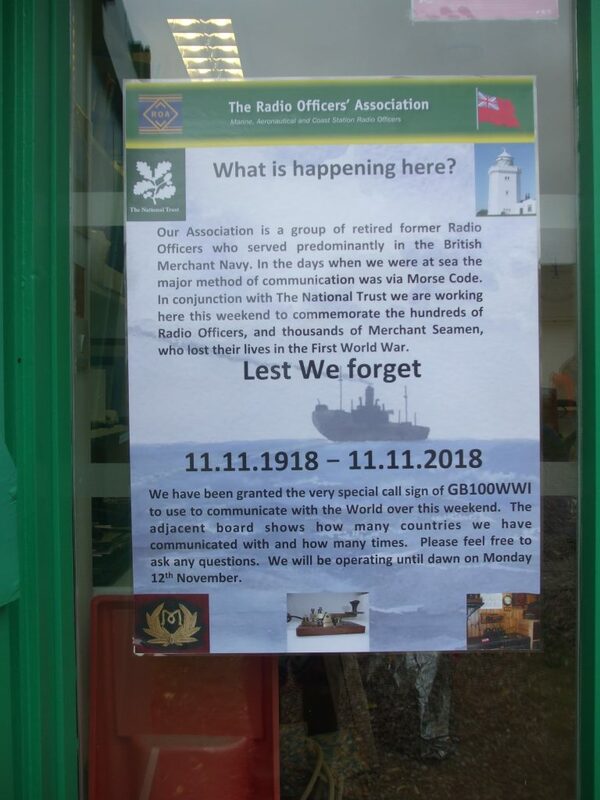 A large A1 sized poster (created and provided by our Chairman) was fixed to the entrance to provide an outline to visitors on what we were doing and why we were doing it. 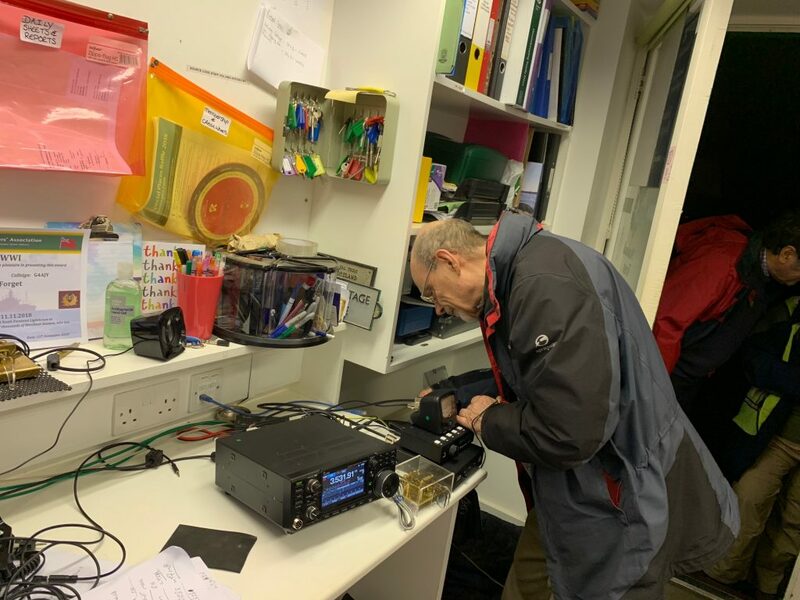 The rig consisted of an ICOM IC-7300 transceiver (100 Watts) fed into an LDG Auto tuner and connected to the antenna via a coax lead and a 9:1 UnUn. Electronic logging was provided by a Laptop running the popular Log4OM logging software. A backup battery and inverter were on hand in case of power failure and a keying interface was deployed to accommodate various types of paddles and straight keys if required. 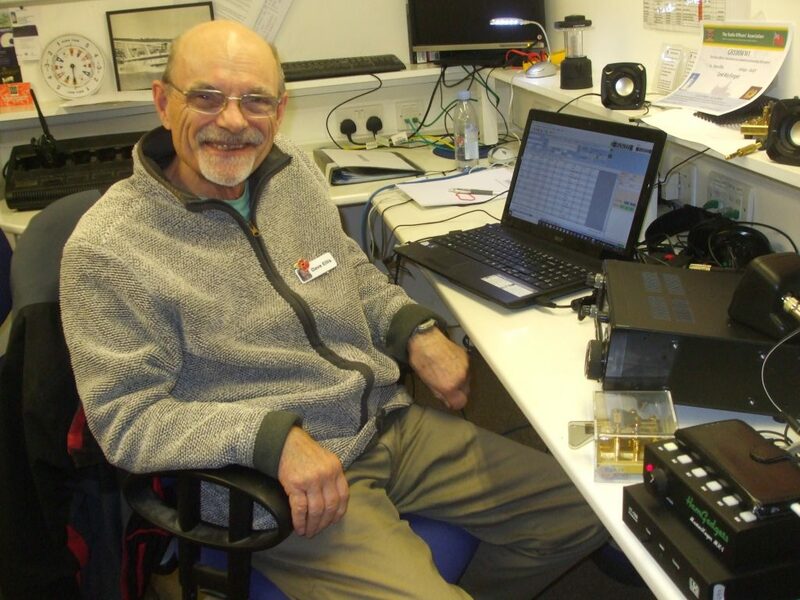 There were some initial problems with RF in the shack and the keyer interface wires but they were eventually sorted out and initial tests showed the rig worked well into the Antenna with low SWR on all bands from 80Metres upwards. 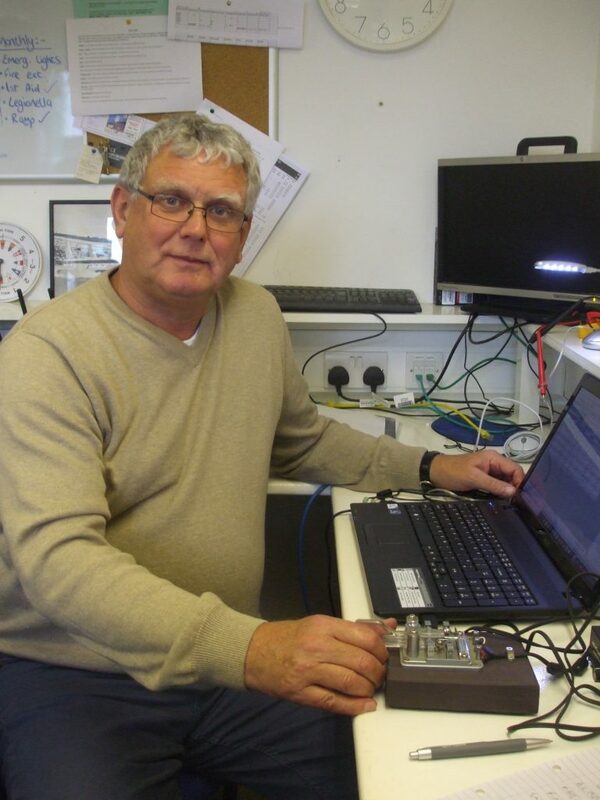 Some test QSOs were made to prove that signals were reaching out OK to the UK and overseas. The equipment was then powered down and the team left the site for the night. 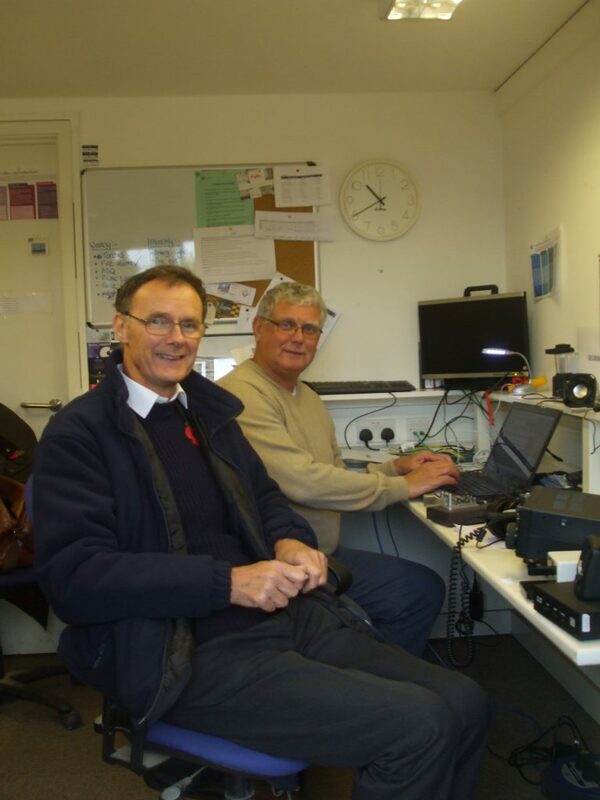 Next morning, Sunday November 11th and our main day for operating the station the team assembled on site to make sure all was well and to brief the first shift Operators Geoff/G0UVX and Tim/G4EOA on how the equipment was set up. 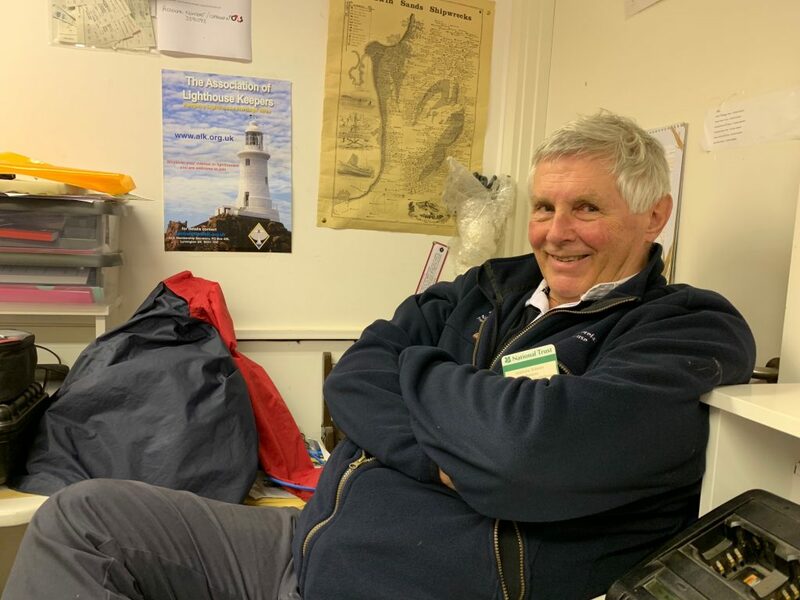 Operations were paused to allow team members to observe the 2 minutes silence overlooking the English Channel at 11.00 AM, the start and finish times being marked by the signal guns at Dover which could be heard quite clearly at the lighthouse. 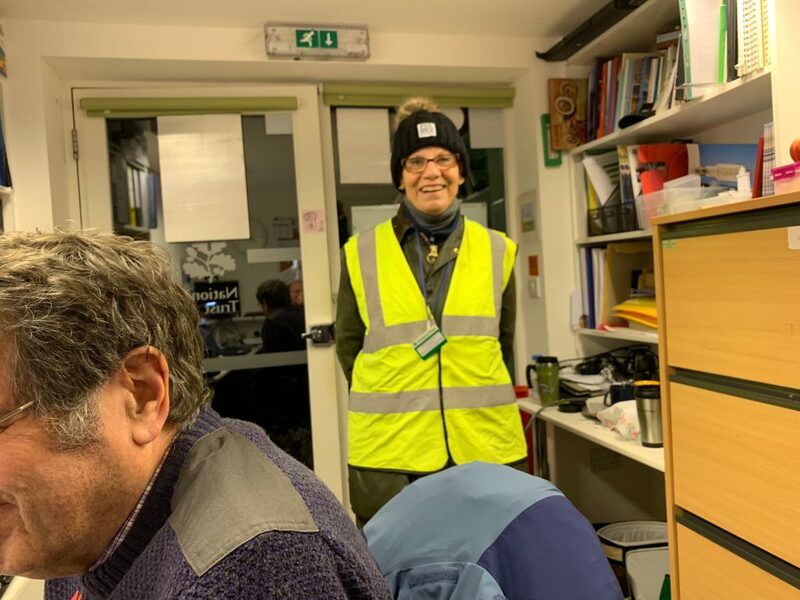 Operations re-commenced and continued until 4.00pm when the next shift consisting of Robin/G3OGP and Nigel/G4BSW arrived on site. 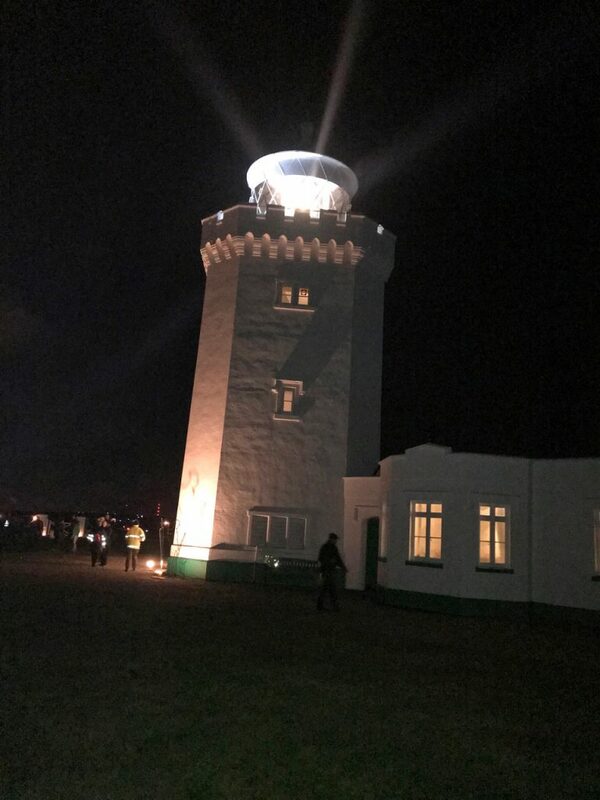 During this shift a formal Remembrance Service was held on site which culminated in the lighting of the Lighthouse Light for the first time in over 20 years. 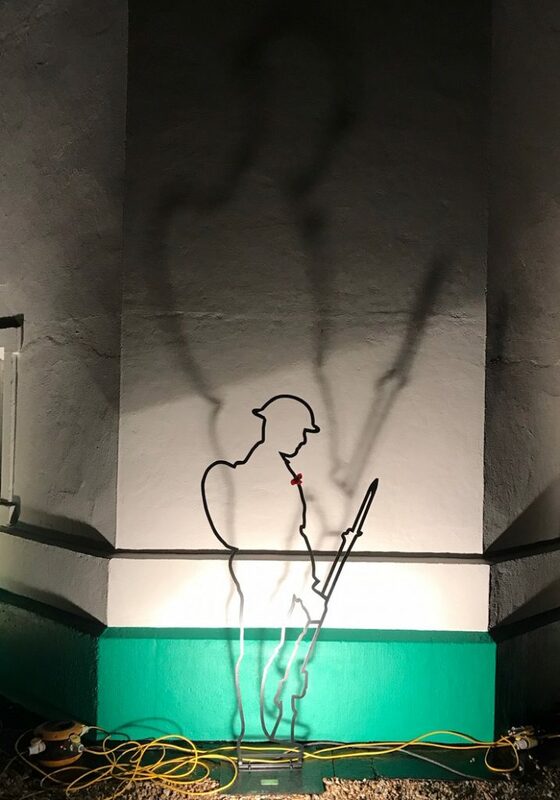 This was part of the Beacons for Remembrance project and over 1000 members of the public were on site to take part in the service and observe the fully operational Light which was a very rare event. Our meet and Greet Team consisting of Chairman Tony Selman and Rosemary were kept quite busy answering queries about the special event station and explaining the role of the Wireless Operator/Radio Officer over the years. 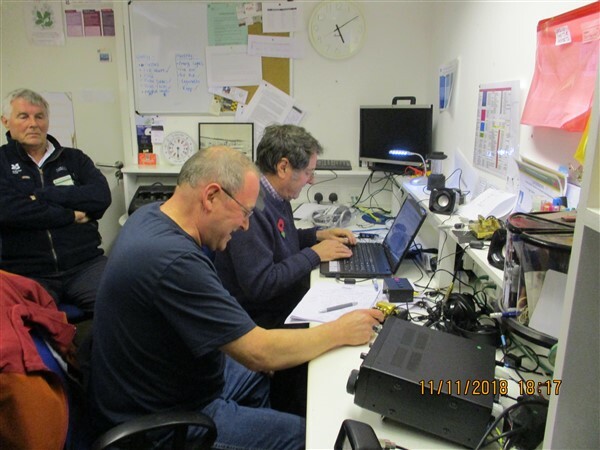 At midnight Peter/M0URL and Dave/G4AJY arrived on site for the “Graveyard Shift” which continued until 8.00 AM on Monday 12th November. 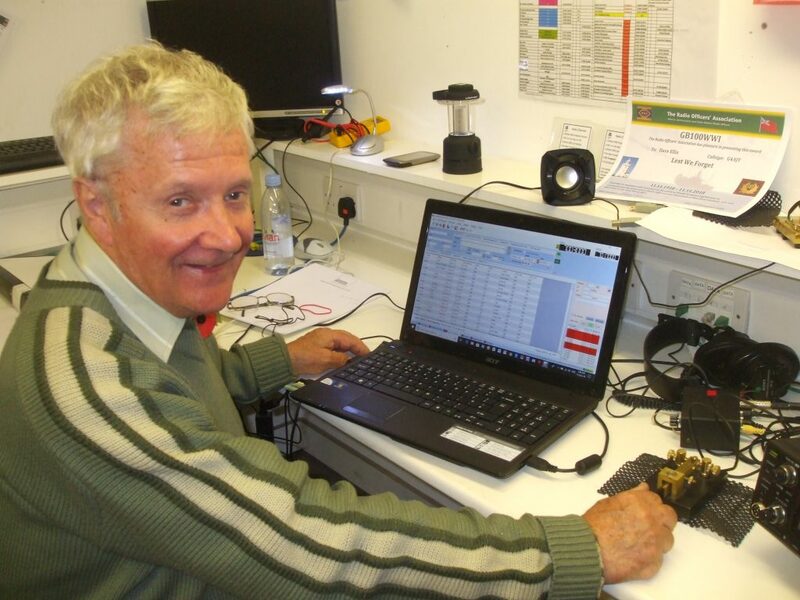 Although the QSOs were fewer during this period they were also more interesting with contacts from North America, India the Middle East and New Zealand. Finally, at 8.00 AM the other team members arrived, operations ceased and the work of packing up began. 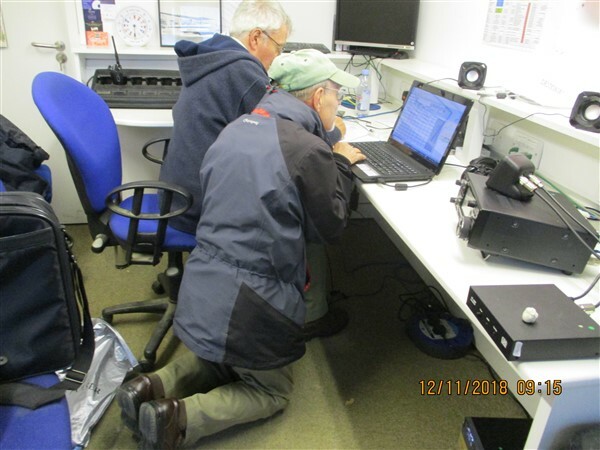 The wind was still quite strong but without the heavy showers the lowering of the Masts and packing of the equipment was all achieved by 9.30 AM and we ensured that the office was left in a clean and tidy state. Everyone finally said farewell and departed the site. Dave/G4AJY and Peter/M0URL travelled back to the rendezvous point and had a hearty breakfast before setting off home. 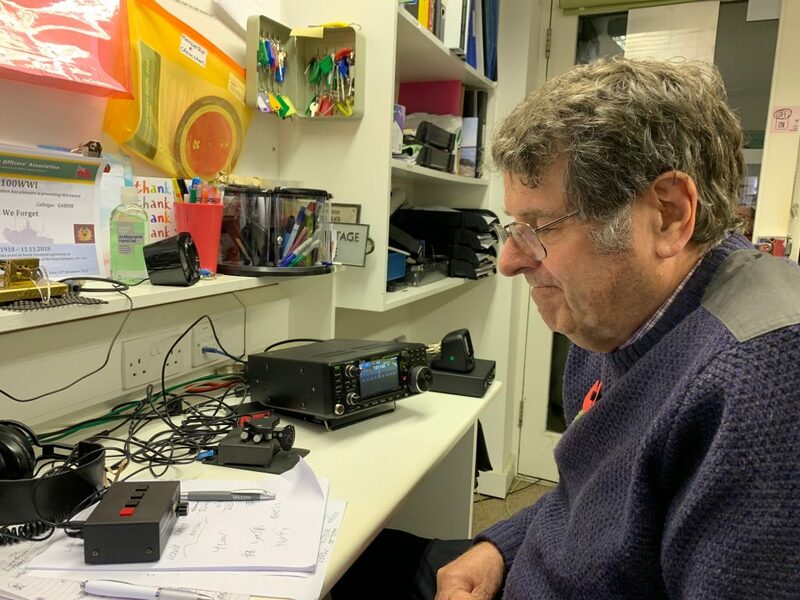 As Dave remarked, it was great to be working the airwaves again in a Radio Room with a fellow ex RO and I think that all who took part in the event would agree with that sentiment.